In an important sense, the previous step is questionable because the variable of integration is different on each side of the equal sign. 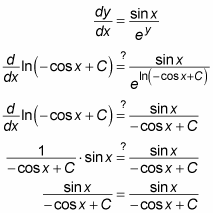 You may think “No problem, it’s all integration!” But imagine if you tried to divide one side of an equation by 2 and the other by 3, and then laughed it off with “It’s all division!” Clearly, you’d have a problem. The good news, however, is that integrating both sides by different variables actually produces the correct answer.